There was no immediate reaction from Catalan leaders who held an independence referendum on Sunday that was banned by Madrid and marked by violent scenes at electoral stations where Spanish police sought to hinder voting. BARCELONA/ MADRID: Spain's Constitutional Court on Thursday ordered the suspension of Monday's session of the regional Catalan parliament, throwing its plans to declare unilateral independence from Spain into doubt. The suspension order further aggravated one of the biggest political crises to hit Spain since the establishment of democracy following the death of General Francisco Franco in 1975. But it helped Spanish markets hit in recent days by the uncertainty. The court said it had agreed to consider a legal challenge filed by the anti-secessionist Catalan Socialist Party. Spanish shares and bonds, which have been hit by the political turmoil in Catalonia, strengthened after the news of the Constitutional Court's decision. The main IBEX stock index rose 2.3 percent, on track for its biggest daily gain in a month, and Spain's 10-year bond yield was set for its biggest daily fall since April. 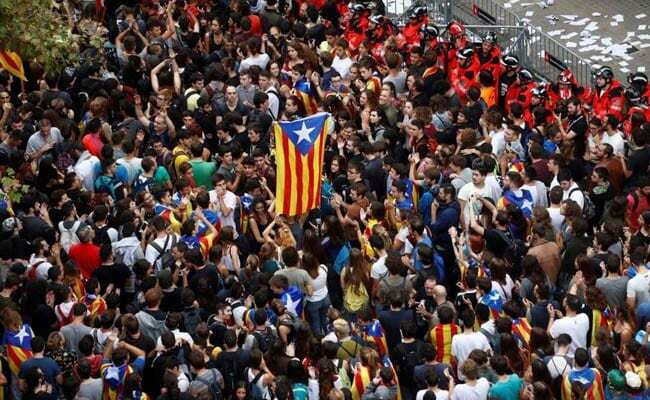 Spain's Economy Minister Luis de Guindos told Reuters in an interview the turmoil was damaging Catalonia. "This is generating uncertainty that is paralysing all investment projects in Catalonia. I'm convinced that, right now, not one international or national investor will take part in a new investment project until this is cleared up," he said. Spain's fifth-largest bank, Sabadell, will consider on Thursday whether to shift its headquarters away from Catalonia in the first major sign that the wealthy region's push for independence from Spain could scare away big business. Caixabank, Spain's third largest lender by market capitalisation, is also considering moving its legal base outside Catalonia, a source with knowledge of the situation said. A spokesman for the bank said no decision had been taken on a move. Prime Minister Mariano Rajoy called on Catalan leader Carles Puigdemont on Thursday to abandon plans to unilaterally declare independence from Spain or risk "greater evils". In an interview with Spanish news agency EFE, Rajoy said the solution to the Catalan crisis was a prompt return to legality and "a statement as soon as possible that there will not be a unilateral declaration of independence, because that will also avoid greater evils," Rajoy said. He did not elaborate but ruling party lawmakers say that Rajoy, a conservative who has taken a hard line on Catalan independence, is considering the unprecedented step of dissolving the Catalan parliament and triggering regional elections. Catalan officials released preliminary referendum results showing 90 percent support in favour of breaking away. But turnout was only about 43 percent as Catalans who favour remaining part of Spain mainly boycotted the ballot and many polling stations were closed. Puigdemont said he was not afraid of being arrested for organising Sunday's banned referendum. "Personally, I am not afraid of that," Puigdemont said in an interview in the German daily Bild, published on Thursday, when asked about his possible arrest. "And I'm not surprised any more about what the Spanish government is doing. My arrest is also possible, which would be a barbaric step." Puigdemont has not explained the scope of his proposal for international mediation, whether it would envisage a compromise short of independence or deal only with divorce arrangements. Rajoy has ruled out international mediation as a format for resolving the future of Catalonia, offering instead all-party Spanish political talks to find a solution, on the condition independence is taken off the table. Sunday's crackdown by Spanish police, Rajoy's hardline stance and an uncharacteristically strong intervention this week by Spain's King Felipe VI seems to have deepened Catalonia's resolve to continue with the project. "We will go as far as people want it. But without the use of force. We were always a peaceful movement. And I am sure that Spain will not be able to ignore the will of so many people," Puigdemont told Bild.